We love documentaries at the Naro. Our midweek ‘New Non-Fiction Film’ series with speakers and discussion continues to gain popularity in the age of Trump. As we search for what’s wrong in our system that has given us such a dystopian nightmare, an in-depth analysis is needed that is seldom provided by mass media. The feature documentary format has become an important vehicle for such investigations, crafted by filmmakers who will dive into complex issues. Unlike mass media, they don’t receive their production money from corporate sponsors. This allows them the creative independence and integrity often being compromised by the big news organizations. The assault on the planet by global finance capitalism has subverted our democracy. The unregulated power, greed, and corruption of the ruling institutions has eroded what remains of our civil liberties, our privacy, and our right to live on a life sustaining planet. In these regressive times, a free and independent media that holds power accountable has never been more crucial. It was a very rich year for documentaries in general and for investigative film journalism in particular. Issues that were tackled by these filmmakers included government malfeasance, the secret surveillance state, unchecked militarism and war, corporate corruption, the concentration of wealth and power, the failure of environmental regulation, and man’s relationship to animals and nature. Needless to say, these films are frontrunners for the Oscar for Best Documentary, and yet it’s a crowded field. There were 166 documentaries submitted to the Academy this year. Way too many films for any one person to view, and so a selection committee of judges will compile the Oscar shortlist of 15 documentaries in mid-December. The listing can be viewed at the website www.oscar.org. This shortlist will later be reduced to a final five nominees for Best Documentary when this year’s Oscar nominations are announced on January 22nd. Many of the docs submitted to the Oscars have received their local premiere at the Naro. But not all of them were made available to the Naro and the other art screens around the country. Some of these titles went directly to Netflix, HBO, or other content networks. They receive only a symbolic showing in a NYC and LA theater so to be able to qualify for the Oscars. Unless theater exhibitors and film festivals organize to exclude from the Oscars those films produced exclusively for streaming services, the theatrical market for art films will continue to suffer. My film choices for the best docs of the year are listed below. My list includes only those films that had a screening at the Naro Cinema. I have grouped them into five categories and listed them chronologically in the order that they were screened during the year. There is no order of preference – each stands on its own as an important film. Filmgoers who missed seeing these films on the big screen have another opportunity to view them when they show up next door on the shelves of Naro Video. These are films that have the potential to enlighten and educate our society. We will take a break from the ‘New Non-Fiction Film’ series during the later part of December and the first part of January, but we will soon get back on track this winter with our midweek ‘New Non-Fiction Film’ series. And we will also continue our FirstLook Film Forum on Sunday mornings when the new Winter Season 2019 starts on January 13th. This subscription based series has 10 designated Sundays to view and discuss acclaimed new feature films in advance of their public showings. 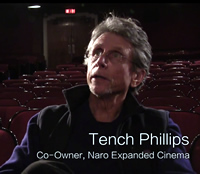 Join a group of cinephiles for the 18th season of the Film Forum by visiting our newly designed website at www.narocinema.com. EATING ANIMALS Animal agriculture over the decades has changed from local and sustainable into a corporate Frankenstein monster that offers cheap food at a steep cost: the exploitation and suffering of animals; the risky use of antibiotics and hormones; and the pollution of our air, soil, and water. Tawai is the term that the pre-agricultural hunter gatherers of Borneo use to describe their inner feelings of connection to all of nature. This philosophical meditation on human culture on the edge of the precipice is from British explorer and filmmaker Bruce Parry (BBC’s Tribe). KANGAROO: A Love-Hate Story Australia’s relationship with its beloved marsupial mammal, but many cattle ranchers consider them pests to be shot and sold for pet food. Now some kangaroo species could go extinct. EVOLUTION OF ORGANIC It all started in the sixties with a motley crew of back-to-the-earth hippies who rejected the poisons of industrial farming. LIFE IN THE DOGHOUSE Danny & Ron’s Rescue has saved and found homes for more than 10,000 abused, abandoned and starving dogs – and many of them live in their own home until they can be adopted. PICK OF THE LITTER Five spirited puppies begin an incredible journey to become guide dogs for the blind in a two-year process of foster volunteers and trainers. The gruesome murders of a wealthy Virginia couple resulted in the conviction of their daughter Elizabeth and her German boyfriend Jens Soering. After 30 years behind bars and forensic evidence establishing his innocence, Soering has repeatedly been denied parole. Now it’s up to Governor Northam to pardon him. Nine years after the 2008 meltdown based on bankrupt mortgages, a new Wall Street heist story about shell Chinese companies is unfolding. Market-based education ‘reform’ has been pushed by conservatives to privatize public schools and dismantle teacher unions. The Supreme Court Justice has developed a breathtaking legal legacy while becoming an unexpected pop culture icon. Larger than life, and a longtime creative force in international fashion design, the life story of André Leon Tally is an inspiration for us all. The life and legacy of Fred Rogers, the beloved host of the popular children’s TV show “Mister Rogers’ Neighborhood” was the biggest documentary of 2018. Forty years after the death of Elvis Presley, filmmaker Eugene Jarecki’ takes the King’s 1963 Rolls-Royce on a musical road trip across America. GENERATION WEALTH The film bears witness to the global boom–bust economy, the corrupted American Dream, and the human costs of late stage capitalism, narcissism, and greed in the Age of Trump. An intimate, profoundly human look at families raising extraordinary children that society deems ‘abnormal’. The fairy-tale reunion of triplets separated at birth sets in motion a series of events that unearth an unimaginable secret. Cannabis has been off-limits to doctors and researchers in the U.S. for the past 80 years. It begs the question – why doesn’t our government want citizens to have access to it? A countdown of Barack Obama’s foreign policy efforts by a team of diplomats as the end of his second term nears. It’s a sobering reality check of how far we have fallen. The Supreme Court’s Citizens United decision has allowed untraceable corporate money to buy off politicians and win elections. The untold history of the progressive movement as founded and championed by Debs, and that continues tooth’s day. An investigation into the 2014 death of Norfolk-based Lt. Wes Van Dorn when the Navy helicopter he was piloting crashed off the coast of Virginia. Michael Moore declares Trump to be “the last president of the United States” and then goes on to show the decline of American empire. DIVIDE AND CONQUER: The Story of Roger Ailes The founder of Fox News has stoked right-wing anger and fear for over fifty years—from Nixon, to the Tea-Party, to Trump. But like a true Shakespearian figure, his ambition and lust were his own downfall. LOVE, CECIL Oscar-winning set and British costume designer Cecil Beaton was also a major photographer, writer, and painter of the mid-twentieth century. FACES PLACES One of the leading filmmakers of the French New Wave, 89-year old Agnes Varda, and acclaimed 33 year-old French photographer and muralist JR teamed up to co-direct this enchanting documentary/road movie. BOMBSHELL: HEDY LAMAR Austrian actress Hedy Lamarr fled her homeland to create a name for herself as one of Hollywood’s top leading ladies in the 1940s. But she was also an inventor who created a radio system that is now the basis of Bluetooth technology. An in-depth exploration of the great poet’s life and work and narrated by Cynthia Nixon, the actress who played Emily in last year’s acclaimed film A Quiet Passion. ITZHAK Master musician Itzhak Perlman’s violin transcends mere performance to evoke the celebrations and struggles of real life. FIVE SEASONS: THE GARDENS OF PIET OUDOLF An intimate immersion into the work of renowned landscape designer Piet Oudolf. SCOTTY AND THE SECRET HISTORY OF HOLLYWOOD Scotty Bowers, who is now 95 years of age, landed in Hollywood right after the Second World War and soon became a confidante and lover to many of Hollywood’s greatest stars including Cary Grant, Katharine Hepburn, and Spencer Tracy. DAVID HOCKNEY AT THE ROYAL ACADEMY OF ARTS Widely considered Britain’s most popular artist, David Hockney is a global sensation with exhibitions in London, New York, Paris and beyond. KUSAMA: INFINITY Currently the top-selling female artist in the world, Yayoi Kusama overcame impossible odds growing up in post-WWII Japan to bring her radical artistic vision to the world stage. Celebrated as one of the greatest athletic feats of any kind, Alex Honnold’s climb of the 3,000 ft El Capitan in Yosemite set the ultimate standard: perfection or death. SEARCHING FOR INGMAR BERGMAN A centennial tribute to the master filmmaker is being celebrated thoughout the world. In his writings, plays and films, Bergman strove for honesty and true self-revelation. MARIA BY CALLAS Tom Volf’s new documentary is the first film to tell the extraordinary life story of the legendary Greek-American opera singer, and to do so in her own words. MANTRA: SOUNDS INTO SILENCE Kirtan is a participatory, call and response Eastern form of chanting and singing mantras. POPE FRANCIS: MAN OF HIS WORD The Cardinal of Buenos Aires, Jorge Mario Bergoglio, in 2013 became the first Pope from Latin America. Filmmaker Wim Wenders has created a film that allows him to share his mission for social, environmental, and economic reform. Excellent brief synopsis of these wonderful-sounding line-ups, most of which I have unfortunately missed! I am actually contemplating moving closer to the Naro in order to take advantage of the fabulous array of out-of-the-ordinary films being offered! !